(Nanowerk News) The hybrid of microelectronic circuits and atoms which combines the best quantum mechanical characteristics of both systems, may help to realize a breakthrough in quantum computing. Not only Andreas Wallraff believes this, but also the European Research Council, which has been supporting his project for five years with almost two million Euros. The thirty eight year-old Andreas Wallraff, Professor for Solid State Physics at ETH Zurich, together with his research group is investigating how atoms can communicate in a controlled manner with an electronic circuit. A 1.9 million Euro research grant from the "ERC Independent Researcher Starting Grants" is allowing him and his team to extend their area of research. So far Wallraff, who moved from Yale University to ETH Zurich in 2006, has primarily been researching quantum mechanical effects in electronic microcircuits. For example, they send photons from one part of the chip to another and observe how they interact with each other. Now the scientists want to connect their electronic quantum mechanical systems to atomic quantum mechanical systems. In order to do so, a new lab is being built in the basement of the laboratory for solid state physics with specially developed equipment. The interior of the equipment, which is gold-plated in places, almost looks like a work of art. With it the quantum mechanical characteristics and effects of atoms and microelectronic circuits are intended to be brought into an optimal interaction. This method is one of several approaches for developing the hardware of a quantum computer, on which multiple logical operations can be carried out simultaneously on so-called quantum bits or qubits. In contrast to a classical computer, which only works with states 0 and 1 and where the computing operations are run in sequence on the bit, in a quantum computer the state of the qubits can be in superposition and accelerate complex computing operations. 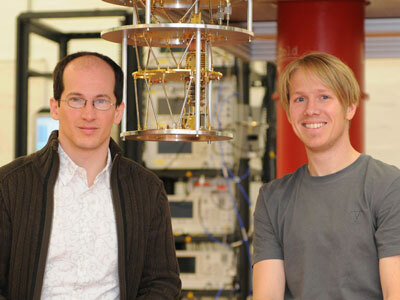 The goal of the scientists on Wallraff's team is primarily to find out how information is written onto a quantum bit, how it can be read out again and how information is transferred. The initial aim is to develop basic components, on which quantum information can be stored for as long as possible and on the other hand it is possible to move between the components quickly and easily. Their chip with microelectronic circuits works with the quantum mechanical characteristics of photons instead of transistors. In spite of the high clock speed of the circuit, the time available for processing quantum information with this type of qubit is very short, as the information stored is currently lost within just a few micro seconds, explains Wallraff. Although the time for atomic qubits at up to one second is much longer, the clock frequency currently achievable is a thousand times slower. By connecting both systems, researchers now wish to combine the advantages of the electronic and atomic systems: This combination is the cornerstone of the quantum computer of the Wallraff group. In Frédéric Merkt, Professor for Physical Chemistry at ETH Zurich, Wallraff has found the ideal partner for the new area of research he is creating. One of his research areas is concerned with Rydberg atoms. They are ideally suited for the atomic processing of quantum information, as they have a diameter which is some 1,000 to 10,000 times larger than a normal atom. As a result they are well suited for interacting with the photons of the electronic circuit. Combining both systems – which by themselves are extremely complex – is a real challenge. For example, the chip has to be produced from superconducting material, so that the information stored on it is retained for as long as possible. In addition thermal photons that are present at room temperature also have to be eliminated. Therefore, the chip must be cooled almost to absolute zero, just a few hundred thousandths of a degree above minus 273 degrees Celsius, which is realized using a specially developed cooling system. Individual photons are created on the microchip. An electromagnetic resonator circuit prevents them from flying off at the speed of light, before they interact with Rydberg atoms, which are guided over the chip. The Rydberg atom is intended to act as a qubit and be switched from state 0 to 1 and vice versa by the photon. The researchers are really excited about the results of this arrangement regarding how and whether the atom and photon will interact with each other. In any case, the aim is that the atoms communicate with the electrical circuit. “Only once we know how it works, can we begin to transfer information between the two qubit systems”, says Wallraff. Realizing a universally working quantum computer still seems a long way off. Wallraff, however, is optimistic and is expecting rapid progress in the development of such a computer. He is, however, certain that his project will not only advance the development of quantum processors, but that it will also make important contributions to the fundamental understanding of the interaction between atoms and solids.